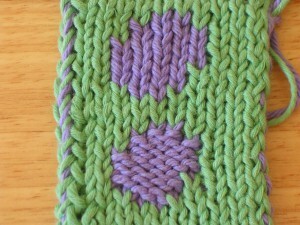 I had a request from an old family friend who’s fond of a green and purple. 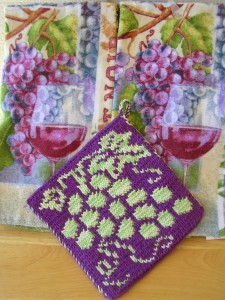 It took me a while to figure out something that comes in both purple and green…GRAPES! 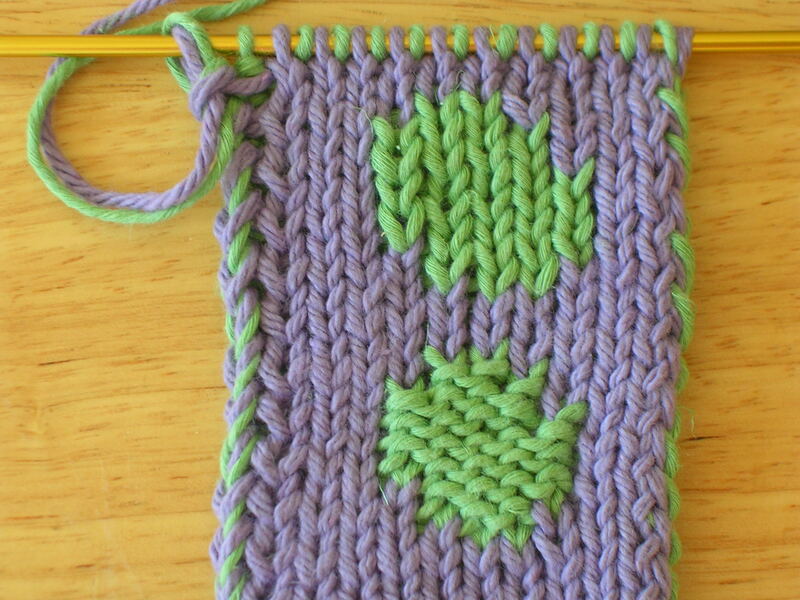 I used Lily Sugar’n Cream (TM) Aloe Vera (green) and Black Currant(purple). 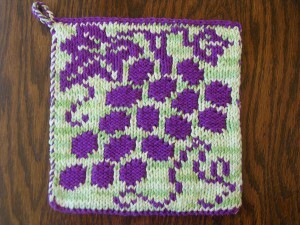 I was originally going to do the whole pot holder in double knit stockinette stitch. Then, I also decided to try using the reverse stockinette stitch for the grapes to help them look plump or puffier a little bit. 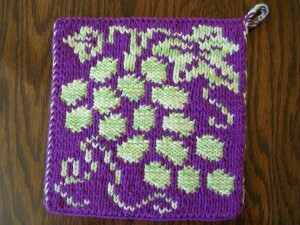 I did the rest of the potholder in stockinette stitch. It worked pretty and has an interesting effect. 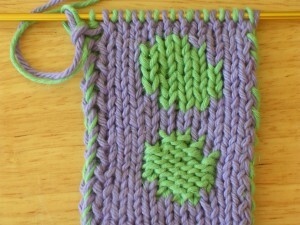 For some reason I feared purling to the outside was going to be difficult, but it is actually easier and faster to double knit since the yarn doesn’t need to go from front to back every stitch. I’ll probably continue to use stockinette in most designs since it just looks more polished to me and that’s what most people use. 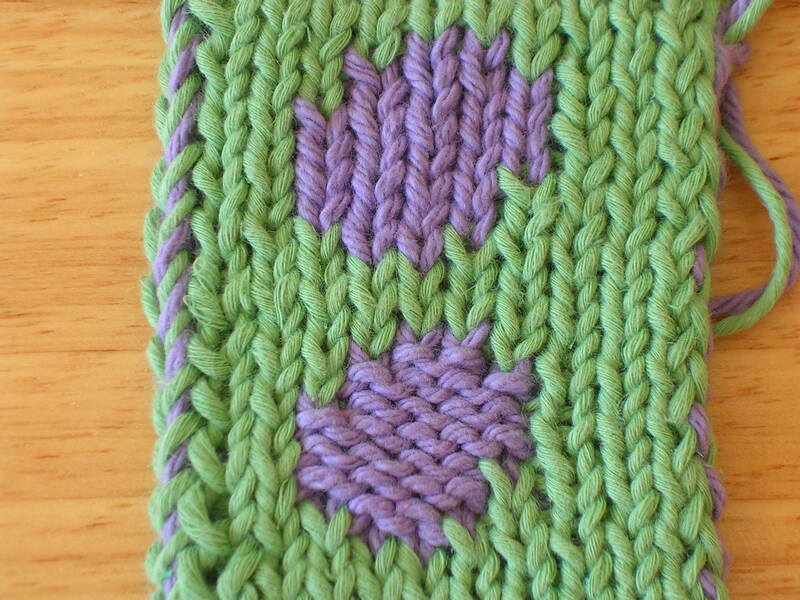 Here’s photos of the test swatch I used to compare (1 grape test) and decide if I like the grapes in Stockinette or Reverse Stockinette stitch and the towels I bought that I think make the gift set more fun. I don’t think she drinks wine, but it is sort of hard to find grape kitchen items that don’t include a wine theme.